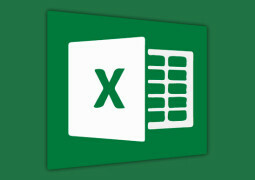 MS Excel allows users to make changes in the alignment of the cell and it can be done various ways. Tab, click on the available options in the Alignment group to change it. Right click on the cells and choose format cell, then select Alignment Tab. Now you can choose from vertical or horizontal alignment. 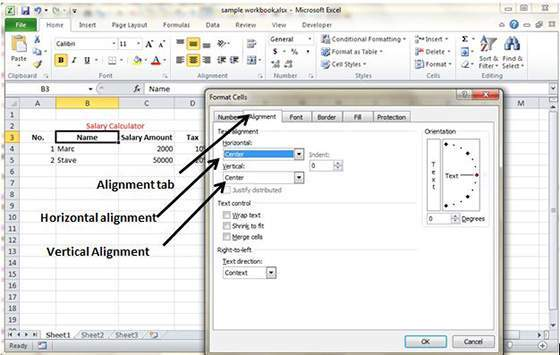 Horizontal Alignment – Users can set horizontal alignment in Left, Center, Right etc. 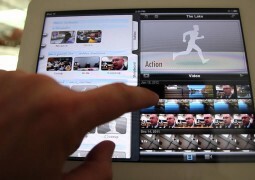 Left – It aligns cell contents to the left side. Right – It aligns cell contents to the right side. Center – It aligns cell contents to the center. Fill – It repeats the cell content till complete cell’s width is filled. Justify – It justifies the text to the left and right of the cell. 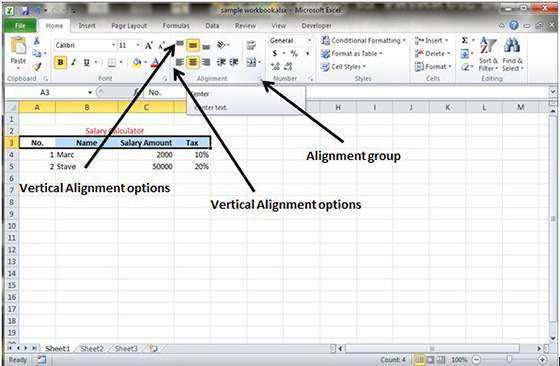 Vertical Alignment – You can set the vertical alignment to the top, middle, bottom etc. Top – It aligns cell contents to the top. Center – It aligns cell content vertically. Bottom – it aligns cell contents to the bottom. Justify – It justifies the text vertically in the cell.